This is what a lot of new vapers encounter when they first start out... it's what they can afford. I buy most (and win some) of my gear and it's what I can afford. In my experience to date, there are roughly three categories of vaping hardware available to the public at large. At the entry level, there are cigalikes and cheap eGo kits at convenience stores. These are fine to get a person started on the journey, but are not really sustainable (in fact a recent study indicated that those that use tanks and clearomizers are more likely to quit compared to those that use cigalike (cartomizers)). The intermediate level is starting to blur, but this includes larger, more powerful clearomizers and easier to operate batteries. The top end is filled with rebuildable tanks atomizers and rebuildable dripping atomizers and mods with some pretty incredible tech inside. But the intermediate level and the top level are not as accessible as the entry level. It would also appear that the government is doing its very best to keep it that way. To step up to something more than a cigalike, you must research and order online and wait, or visit a local brick and mortar shop... if you have researched enough to know that there are brick and mortar shops... and if you have one in your area. Then comes the purchase. Initially, many are told that vaping is less expensive than smoking. It is! But the savings comes only after the initial investment. That initial investment can range from $4.99 for a disposable cigalike from Walmart to more than $5000 (yeah, I wrote five-thousand-dollars - and that mod doesn't come with an atomizer or e-liquid, hence the "more than"). A more realistic figure for a more realistic kit falls in the $100 range. That would include a handful of rechargeable, adjustable eGo batteries and matching clearomizers, as well as coils, case, chargers and e-liquid. When I quit, that was no savings. That was two weeks worth of cigarettes with no guarantees. Scary! However, if you stick to vaping (and don't get too sucked in by the vaper's shinyitis syndrome that compels you to purchase every new mod that comes out), you'll find that the e-liquid is far less expensive than cigarettes. The devices are rechargeable. The coil heads replaceable or repairable. Eventually, saving money becomes a reality. I installed an app on my phone that informs me that, based on my average e-liquid consumption versus my average smoking, I have avoided 3720 cigarettes while using 1116 ml of e-liquid for a savings of $667 in the past 186 days. That's no where near accurate as it does not include what I've spent on wick, wire, mods, batteries, stands, tools, and, well, everything else. Even so, after running it all through a spreadsheet, I've saved a few bucks, and I feel better, to boot! Of course, if you DO catch the shinyitis bug, all bets are off. You can easily spend thousands of dollars on new mods and tanks and coils and premium juice every month. You can, but you don't have to. But, I digress... a lot... I review what is reasonable and available and affordable and functional. 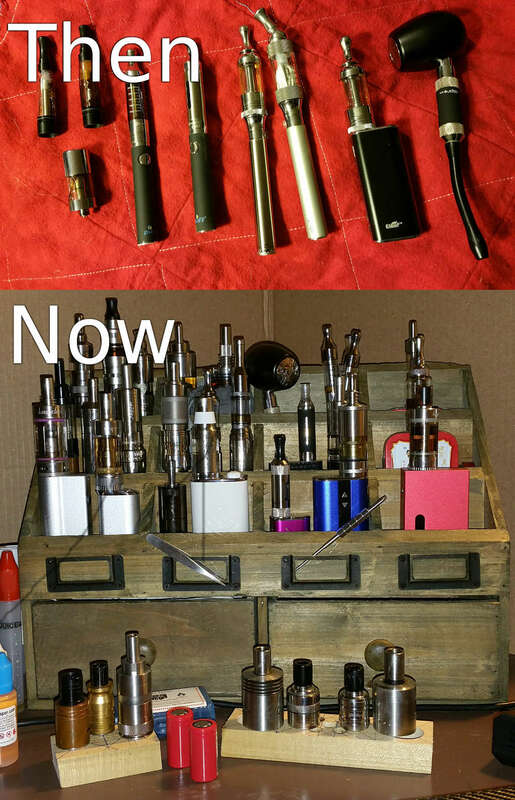 I do this so that new vapers do not have to spend as much nor be as disappointed as I was when I started vaping.